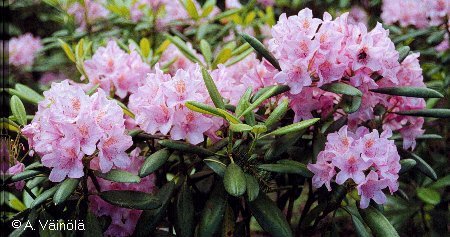 Rhododendron breeding began at Helsinki University in 1973 and in 2001 there were nine named Finnish cultivars. The cultivars are sold in Finland and Scandinavia, but also in the United States and Canada. New cultivars will be introduced in the early years of the 21st century. Click the photos to make them bigger. 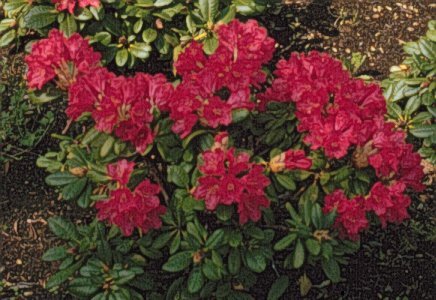 The first Finnish rhododendron was named 'Elviira' in 1986. 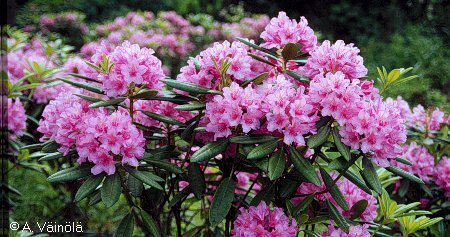 It usually flowers in late May and is the first rhododendron to come into bloom in Finland. It forks prolifically to form dense growth. When fully grown, it is only about one metre in height and about the same in width. The bushes should be protected from the glare of the late winter sun. 'Eliviira' was named after its breeder Marjatta Uosukainen's grandmother. 'Haaga' is an upright growing bush that forks well. It has round crowns and grows to a height of 1.5 - 2 metres. 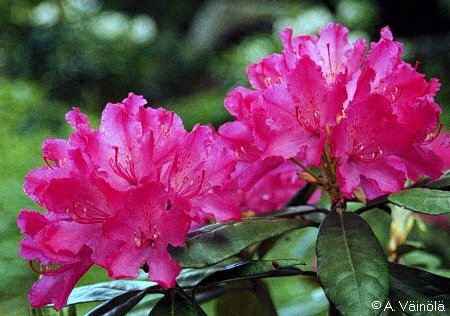 The pink flowers feature easily distinguishable darker blotches. 'Haaga' flowers around mid-June. It was named after the city district in which Laajasuo Park is located. 'Hellikki' is a round bush growing to a maximum height of about 1.5 metres. The purple-red flowers fade as blooming progresses. The buds and young annual growth are covered in yellowish down. Fully-grown leaves are shiny on top and downy on the underside. 'Hellikki' was named after the mother of its breeder, Marjatta Uosukainen. The bushes burst into bloom in early June. 'Helsinki University' is an upright plant, reaching more than two metres high when fully-grown. The young saplings have a reddish tinge. The subspecies was named in 1990, the 350th anniversary of the university. Since it is only one metre high when fully-grown, 'Kullervo' is ideal for small gardens. The young leaves are covered in down. 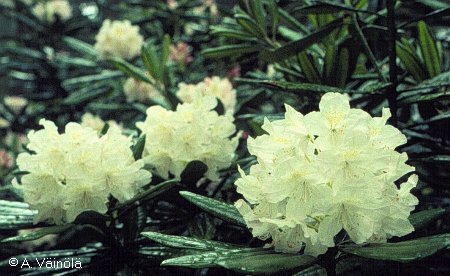 Like many other white flowering rhododendrons, the buds and flowers of 'Kullervo' are initially pink, but later turn to white. The degree of redness depends on the biotope and weather conditions. 'Kullervo' gets its name from the Kalevala, the Finnish national epic, and a composition by Sibelius. 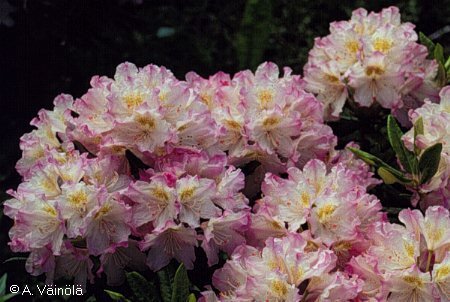 A prolific flowerer, 'Pekka' is especially suitable for large gardens and parks. The flower clusters are full, with delicate light pink flowers. The leaves are a beautiful light green. Budding leaves and annual shoots are covered in a brownish down. 'Pekka' was named in memory of city gardener Pekka Jyränkö. When fully grown, the plant reaches over two metres in height, but is not very forked. The white flowers have blood-brown blotches. The subspecies was named after professor of plant breeding P.M.A. 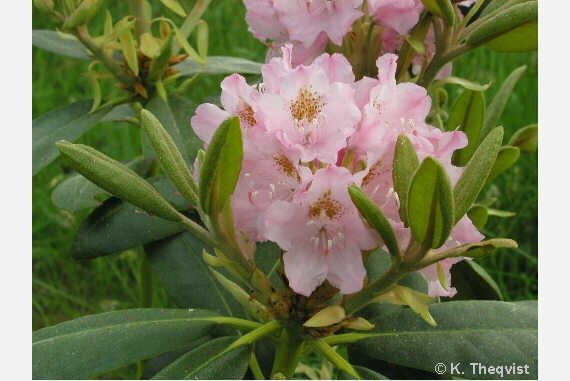 Tigerstedt, whose favourite rhododendron it is. 'Pohjola's Daughter' is a low dense bush, growing about 1 metre high, with much forking and often broader than it is tall. The flower buds are bright violet-red. When open, the flowers are almost white, with green or brown blotches. The subspecies is named after a character in the Kalevala, the Finnish national epic, and music by Sibelius. 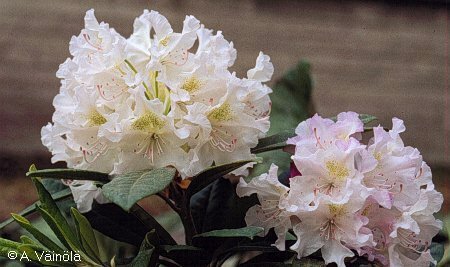 'St Michel' is the hardiest Finnish rhododendron. It was named after the city of Mikkeli in the province of Savo. It has dense, dark green leaves. 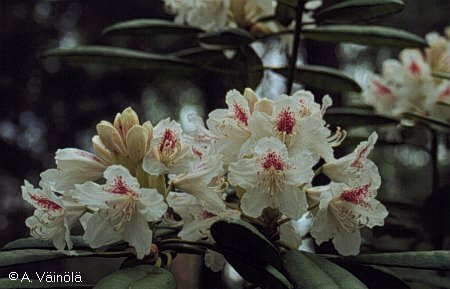 The plant is an ideal backdrop for other rhododendrons. 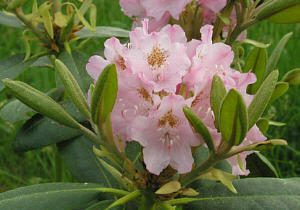 Coming into bloom at around midsummer, 'St Michel' is the last Finnish rhododendron to flower. A light down covers young shoots and unopened leaves. Original text Anu Väinölä 1999, update Kristian Theqvist 2004.